With the chill in the air, it is starting to be soup season. 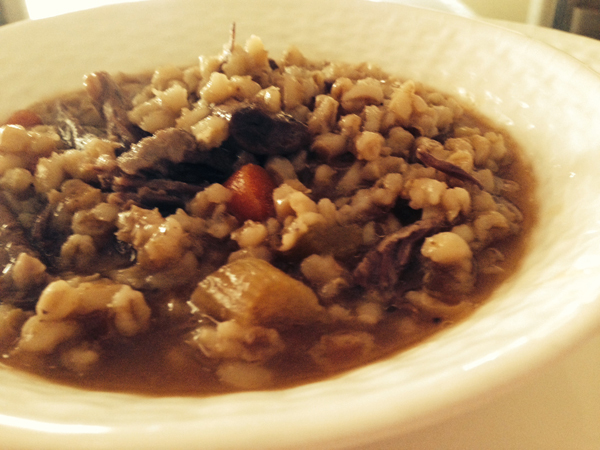 Last night I made one of our favorites; Beef Barley. I love how hearty and robust this dish is. I serve the soup with a salad and crusty bread, and it is a delightful, comforting meal my entire family enjoys. The kids even take it to school for lunch, as it keeps well in a thermos. The other thing I love about this recipe is what I can do with the leftovers. See the note at the end for another terrific meal option. Heat the olive oil in a Dutch oven. Working in batches so you don’t crowd the pan dredge the short ribs in flour (shake off any excess) and sear over medium heat until the ribs are browned on all sides. This should take about 10 minutes. As the ribs are done browning, remove them with a slotted spoon and place them on a plate. When all the ribs have been seared and removed from the pan turn the heat to medium low and add the carrots, celery, shallots, mushrooms and garlic. Cook the vegetables until they begin to soften (about 6-8 minutes). Add the thyme, bay leaves, broth, salt and pepper and stir. Add the short ribs and any juices that accumulated back into the pan with the broth and stir. Bring the soup to a simmer and then cover the pot and cook for two hours. The meat will be tender and falling apart. Take the soup off the heat and place the short ribs on a plate to cool enough that you can handle them. Remove the meat from the bone and shred it with your fingers. Place the meat in the soup. In a large pot bring 4 cups of water to a boil. Add one cup of barley and cook uncovered for 30-40 minutes (until tender). In the meantime place half a cup of broth into a measuring cup and add the cornstarch, whisking until smooth. Place the soup back on the stove at medium heat, and pour in the cornstarch mixture. Whisk until the soup comes up to a simmer. The soup will thicken slightly. Drain the barley and add it to the soup. Cook for another 20 minutes at very low heat (uncovered). The Elegant Occasion Note: Want to try something a little different with the leftovers? Place the left over soup in a sauté pan over medium heat and continuously stir the soup as you would a risotto. The broth will be absorbed by the barley and you will have a lovely barley risotto. Place the risotto on plates and garnish the dish with shavings of parmesan cheese!